It’s now a week since I watched the midnight screening of “Star Wars: The Last Jedi” at the Brewery Arts Centre here in Kendal, and I thought it was time I put down my thoughts about it. Well, everyone else is! So, here’s my review – but a warning: this is full to bursting with spoilers, so it’s a review for people who’ve seen it and are interested, for whatever reason, in a fellow Star Wars fan’s view. If you haven’t seen the film yet then for pity’s sake don’t read any further because it will RUIN it for you. Any spoilers you read but didn’t want to read after this point are totally your own fault. Ok… so… cards on the table, I am a HUGE Star Wars fan, have been since 1976 when the release of “Star Wars” was still a year away. I remember reading about it in the papers, seeing the pictures, etc. I even had a Star Wars scrap book full of cut out images of Chewbacca, stormtroopers and the rest of the cast. I made model TIE fighters out of straws and cotton reels, and pretended the ring pull from Coke cans was a teeny tiny Millenium Falcon. I carried a piece of wood around in my pocket which, in my head, WAS a lightsabre. Yes, I was that geeky Star Wars kid. And as the years passed, and as each new “original trilogy” film came along, I went to see it, and loved them. Then the godawful “prequels” came along and almost ruined the whole thing. I came out of the cinema after watching “The Phantom Menace” literally wanting to punch a wall, it was so crap. Thankfully the epic last half hour of the final prequel pulled things back from the brink, and I still watch the “birth of Vader” with a big grin on my face. But the original classic trilogy… they remain things of beauty, and art, and romance to this day, and I know I will always love them. Then along came “The Force Awakens”… I know it has its critics, but I watched that film feeling like a kid back in 1977 again. I bounced out of the Brewery Arts Centre like a labrador puppy let loose on a beach. I LOVED it. There was a real joy about that film, and J nailed the characters, and gave us some truly memorable visuals too – the Falcon soaring up into the sky, Rey living in the remains of the AT-AT, the Star destroyer wreckage lying in the desert, and many more. At the end I was grinning and so was everyone around me. Star Wars was back! And then came “Rogue One”… and it broke my heart like a dropped vase. Not because it was bad, but because it was so, so good. I was hypnotised through the whole thing, and at the end when Jyn and Cassian died, yes, I blubbed like a baby. I left the Brewery genuinely in a state of shock, and when I got home and stumbled through the door, lost for words, Stella actually asked me what was wrong, what had happened on the way home… I was just in bits, the whole film had been magical from start to finish. For me, “Rogue One” is THE best film of the whole franchise – yes, even better than “Empire”. That might be heresy to some of you reading this, but it’s just a personal opinion, chill out! And a week later I have to agree. Yes, I enjoyed it. It’s ok. But it’s not as good as Empire. And it’s definitely not as good as Rogue One. IN MY OPINION, of course. Others love it to death, and are besotted with it like I am with Rogue, but speaking personally I was left a little “meh” by the whole thing. Well, not the whole thing – parts of it. Parts of the story, I mean. Yeah, I should explain. Being positive first – the film looks absolutely jaw-droppingly GORGEOUS. The effects are faultless, the design is beautiful, the whole thing looks like a beautiful painting from start to finish. The action sequences are thrilling and exciting too, with some of the best space battles seen in any Star Wars film and possibly THE best lightsabre fight in the whole franchise (when Rey and Kylo are fighting side by side and back to back… just brilliant!). And there are many, many scenes in the film which contain true Star Wars classic moments every bit as magical as those in other films in the series. When Yoda appears… when Luke sees Artoo… when Luke returns to the Falcon’s bridge… all touching and moving little snapshots of Star Wars greatness. Huge chunks of the story are dumb. I mean, just double Picard face-palm dumb. The whole premise of the remains of the Rebel Fleet being chased *in a straight line*, by the First Order starships, like the Colonial fleet being pursued by the Cylons in “Galactica”, is ridiculous and lazy. Why didn’t Hux or Ren just order a star destroyer to jump AHEAD of the Rebel fleet and cut them off? This part of the film also introduced us to one of the greatest wastes of space ever to appear in the whole franchise – Benicio del Toro’s character, “DJ”, who was obviously supposed to be some kind of wide boy scoundrel in the Han Solo mode but just came across as a drunken bum. del Toro mumbled and grumbled and slurred his way through his scenes, like he always does, and I thought every moment he was on screen was a moment wasted, to be honest. I hope we don’t see him again. But I fear we will. In fact, the supporting characters were not treated well in the film at all, I thought. Finn – no “journey” or development at all this time. Just there to shout “yeah!” and look sorrowful now and again. Funny entrance though. Phasma – what a waste, if she actually is dead. One of the most intriguing characters seen in the franchise for years, gone, just like that. I hope she cheats death and comes back in the next one, because if she doesn’t I’ll be well hacked off I can tell you. Poe – again wasted. They stripped his cheeky charm away from him and just made him angry and frustrated. I missed the wicked-glint-in-the-eye Poe we all loved in “Force Awakens”. Leia… started off well, full of angst and disappointment, and frustration and fear, and of course Carrie Fisher brought the role to life again, and at the end of the film she is still heroic, still noble, still The Leader we would all follow into the fire… but that part halfway through when, after being blown out into the void, she comes gliding in from space, floating in through the side of the starship like bloody Tinkerbell was SO stupid I almost shouted “Oh come on!! !” at the screen. I know Star Wars is a space fairy tale, and it’s wrong to take it too seriously, but that was just… stupid… not moving at all. It was clumsy and, again, lazy, like that moment in one of the prequels when, suddenly, R2D2 remembered he could fly, and took off into the air to jet around like Mark Whatney doing Iron Man in his punctured spacesuit at the end of “The Martian”. Elsewhere the film is genuinely stunning. The Rey/Ren storyline is engrossing and intriguing, and I honestly couldn’t tear my eyes away from the screen when those two characters were on it. The return of Luke Skywalker is every bit as epic as it deserved and needed to be. The hardware is great to look at, and the battles are impressive. And, as I said, the film is absolutely beautiful to look at, with many scenes that turn the screen into a canvas that is painted with so many lovely colours and scenes that it makes you want to watch it again just for those moments. It was a great shame, I thought, that the “crystal foxes” weren’t use more, they are my favourite animals for a long time. Yes, the Porgs are cute, of course, great comedy creations… but foxes, made out of crystals… that’s genius, right there, and shows just how innovative and “outside the box” the Star Wars universe can be. …but big chunks of the story let it down. They could easily have cut out the whole of the “casino planet” section (Oh look, another bar full of bizarre aliens… another alien musical group… yawn….) and the film would not have suffered one bit, not one bit, from losing that half hour. True, it would have meant rewriting the whole “code breaker” subplot line but I’d have been okay with that, because it was stupid anyway, and the del Toro Han Solo-wannabe character at its centre was a mumbling, shuffling tramp. I know the character was an attempt to “blur the lines” between the good guys and the bad guys, by showing that both sides buy weapons, and with a different actor in the role it might have worked better, but for me it just didn’t come off, and was one of the film’s most criminal wastes of time and effort. Will I go see it again? Yes, of course I will! And I’ll buy the DVD, ad no doubt I’ll find more things in it that I like. And if anyone reading this loved it, I’m honestly happy for you! I wanted to love it myself, I really did, but in the end it disappointed me in quite a few ways. But that’s ok; no Star Wars film is ever, EVER going to please ALL the fans. Star Wars is different things to different people. I just thought, for all the good bits – and there are lots of them – it was a film of wasted potential and opportunities. But it sets up the next one big time…! Back in 2010 I wrote a post for this blog which was my most popular – well, most controversial! – ever. Called “Two things NOT to buy for Christmas” it explained to readers why I thought they shouldn’t buy either a star or a telescope as a Christmas gift for someone. The advice about not buying a telescope led to many people posting comments telling me I was being too negative, and that I was wrong to try and put people off astronomy. I still don’t agree I was doing that at all, because back then there honestly just weren’t many good “absolute beginners” telescopes available, and I was trying to point out the perils of buying someone a telescope that would be too advanced or them. No, I haven’t changed my mind about the whole “star naming” thing. I still think that is a cruel rip-off. But my advice about not buying a telescope is now badly out of date, because since I wrote that original post several respected and reliable telescope manufacturers have produced very good beginners telescopes suitable for adults or children wanting to “get into” stargazing. I also thought it would be useful to actually suggest some ideas for smaller, less expensive gifts too, instead of just being all negative and Grinchy! So, here we are then, some personal thoughts on things you can – and definitely should not – buy as gifts this Christmas for your friend or relative who is into this amazing spacey stuff. I hope some of you find it useful! First of all, do not, Do Not, DO NOT “buy” your son/daughter/wife/husband/mother/father a star, or pay to have a star “named” after them. Because all you’ll be paying for is a piece of paper. There are now LOTS of companies that offer to give a star in the sky the name of your choosing – for a price, of course. Google “Name a star” or “star naming” and you’ll find that there are a gazillion of them online, and you can even buy “gift packs” from Argos, Boots and other shops. If you don’t know how they work, for your money you get to name the star, a certificate, a chart showing the location of your star and – well, that’s it basically. The impression they give, these companies, is that you then exclusively “own” the star, and that it will be known by that name forever. If you “buy a star”, the only place, the only place the star will bear your chosen name is in that company’s register, on its database. No astronomers will ever refer to it by that name. No astronomy magazine’s or book’s star charts will ever give it that name. No observatory anywhere in the world will ever recognise or use that name. I should make it absolutely clear here that it’s not illegal, or a “con” in the legal sense of the word. The companies themselves actually admit that it’s not “official”. If you take a look at the FAQ on the website of one of the most popular star naming companies you’ll see they’re quite open about it: ( http://www.starregistry.com/faq.cfm ) But the general marketing of the product does give the impression that for your £15 or £20 or whatever you’re paying, you are naming a star in the sky and that star will bear that name for ever, and future generations will call it by that name, thus immortalising your son/daughter/dog/goldfish. That’s just not true. How popular is this? Well, every year many people unwittingly fall for it, because a) most people are very ignorant about the night sky and the world of astronomy, b) the packages are very glossy and the advertising blurb very convincing, and c) on the face of it it seems like a great idea, a lovely gesture, to name a star after a loved one. I mean, what could be more romantic or sentimental, than to name a twinkling star after your wife, husband, mother, father, sweetheart or newborn child? Again, it has to be said that many of the companies actually admit all this. But the people to whom these star names are “sold” aren’t going to be looking at or for small print or FAQs; they’re looking, often, for a way to cherish and preserve the memory of a loved one, dead or alive, and, like most consumers, believe what they’re told in the big bold colourful lettering, not in the small print. And that is why I don’t like this. People have told me “It’s just a bit of fun, stop taking it so seriously!” and okay, yes, maybe that’s true, and if you hand over your money totally, 100% aware that your gift is not a physical thing, if you’re making a gesture, if you know that it’s basically “a nice thought” and nothing more then that’s fine, it is a lovely idea. But the problem comes when people DON’T buy these products for the right reasons, when they buy them genuinely believing they are paying to have a star named after a loved one, and that it will be known by – and called – that name in the years and centuries to come. I’m afraid that’s utter, utter rubbish. And if you are sitting there reading this with a sneer on your face, or rolling your eyes, thinking “Oh lighten up, it’s just a bit of fun! Stop being such a grump!” well, you haven’t seen the look on a person’s face when they’ve learned that the star they thought they’d named after a deceased loved one or a beloved fiance or wife isn’t actually called that after all. I’m often asked by people at observing events if I could show them “their star”, or the star they bought for someone, and I have to tell them – kindly, gently, I’m not a monster! – that I can’t because they didn’t actually buy anything. I could lie to them, but that would be unfair, and cruel, I think. They deserve to know the truth, and the truth is they’ve been taken advantage of by people who are out to make money out of their grief or their love, and that’s wrong, I think. In theory, “star naming” is harmless, and yes, in some cases it might lead to some people following up their purchase and getting more seriously into real astronomy, but these are the exceptions. I think the whole star naming thing is wrong, I just do. I feel very strongly about, I don’t mind admitting. I refuse to give any kind of support to this practice, and will do anything and everything I can suggest the people I come into contact with – at my astronomical society’s star parties, at the Outreach talks I give, and at other events – shouldn’t buy a star. And again, if you’re reading this thinking “Oh stop over-reacting!” then the way out is at the top of the screen on the right there, that red box with an “X” in it. This is my blog, and this is how I feel. So, no. I don’t – and won’t – show people “their star”, for two reasons. Firstly, I’d be collaborating with the star-naming companies, giving them tacit support for their ‘product’. By focussing my ‘scope on that star I’d be saying, effectively, “Here you go, this is the star you bought…”. Secondly, I don’t need to show those people “their” star to get them interested in real astronomy. If they’ve hung around after being told – kindly, and gently, but truthfully – that they’be been conned, I’ll show them Saturn’s rings shining like glowing hoops around the planet and tell them that they used to be a moon before it was shattered in a cataclysmic collision… I’ll show them the lavendar and grey whirls and whorls of the Orion Nebula and tell them there are stars being born in there… I’ll show them the breath-on-glass fog of M31 and tell them that they’re looking at a haze of stars 2 million light years away… I’ll show them the salt and pepper stars of M15 and tell them that if they lived on a world whipping around one of those suns their night sky would be ablaze with beacons of light… and I’ll tell them to look up, at the sky above them, and tell them that each of the stars twinkling there is a sun, a distant sun, and that if there are aliens “out there” then our sun is just a star twinkling in their sky after their own sun has set. Don’t get me wrong, I would never ridicule or make the victims of star-naming scams feel bad. I don’t jump up and down, pointing at them and laughing “haha! suckers! !” in the middle of a busy star party when they tell me what’s happened. I go to great lengths to explain to them that although what they did was a wonderful, loving gesture, it wasn’t what they were thinking, or indeed paid for. They’re victims of clever salespeople, that’s all. Let’s look at this from a different angle. If someone came up to you in the street this afternoon and offered to sell you a brick in the Great Wall of China, or a rivet in the Golden Gate Bridge, or one of the eyes, nostrils or ears of one of the faces carved into Mount Rushmore, would you be tempted? No. You’d tell them to take a hike – or use a rather more to-the-point bit of Anglo-Saxon language! Now, would you be tempted to buy one of those things for a friend or relation or loved one, thinking they might then develop an interest in Oriental history, civil engineering or sculpting? No, of course you wouldn’t! The whole star naming thing is no different. It’s a rip-off, aimed at people with good hearts, often aching hearts, who don’t know better, and are easy prey. When I tell people the truth about star naming, sure, some are angry at me for “lying”, or shattering their illusion. Some tell me I don’t know what I’m talking about because, after all, they have a Certificate to prove the star is theirs. But most of them are very grateful that I’ve been honest with them, because it means they won’t go on to recommend the idea to others. So although I don’t ridicule them, I won’t lie to them through silence, because if I didn’t say something then they could tell one of their friends about their “gift” and ker-ching, that’s another $50 or £25 in the bank account of a businessman somewhere. Let me make it perfectly clear – the people who work for these companies aren’t monsters, or crooks, or bad people, I’m sure. They’re just making a living, and we all have to eat, right? And selling star names isn’t illegal. Anyone reading this blog could set up their own company to do exactly the same thing. Go ahead, try it. Each to their own. But the product is a non-product. They’re essentially selling fresh air. They are taking money for a service that doesn’t exist, for an end product that doesn’t exist, and leading people to believe they’ve Done A Good Thing. You must decide if you want to support that – or tolerate it – or not. At the end of the day, it comes down to personal choice. So, if you were thinking about “Buying a star” for someone this Christmas, it’s entirely up to you. It’s your money, and if it’s something you want to do to make someone feel good, or if you think it will help them through a bad time, it’s entirely up to you. On the face of it, “buying” someone a star is a lovely gesture, it really is. All I’m saying here is just be aware of the actual truth of the situation, ok? My personal recommendation would be – don’t do it. Don’t fall for the slick packaging, the fancy words or the romantic imagery. Buy a huge bunch of flowers instead, or a nice photograph. Every year in the run-up to Christmas I get phone calls, letters and emails from people wanting advice about buying a telescope. Some of them I happily recommend telescopes to, because they tell me they are already “sky-watchers” and are wanting to take the next step in the fascinating hobby of amateur astronomy. But very often I am contacted by people who are wanting to jump in at the deep end of stargazing by buying a telescope before they have even learned the constellations, or swept across the Milky Way with binoculars. Maybe they’ve been inspired by a TV program, or a lecture they’ve attended, or maybe they’ve looked up on a gloriously clear night and noticed the beauty of the night sky for the first time. But they have suddenly decided they want to buy a telescope with no prior observing experience whatsoever, so they contact me asking for advice. And, as is the case with the whole star-naming thing, I have to lay my cards out on the table and be honest with them. I’ll be honest – my views on this have changed. When I wrote the original post back in 2010 I recommended against buying a telescope, ANY telescope, because of a) my own personal experiences and b) what was available to buy at the time. Back then there were very few telescopes suitable for absolute beginners to buy, and my concern was that buying someone a telescope that was too advanced, too powerful and too complicated to set up and use would actually put them off astronomy for life rather than introduce them to a hobby that would enrich their life. Now, though, there are lots of good “beginners” telescopes out there, so I am happy to recommend them as gifts for your starry eyed friend or the budding astronomer in your family. The key to buying a telescope as a Christmas gift is KEEP IT SIMPLE. The adverts online and in magazines can give the impression that bigger is better, that complicated is better, that the more twiddly and fiddly bits a telescope has the better it is. Rubbish. The best telescope you can buy someone as a present is one they will actually be able to use, and for an absolute beginner that means buying a telescope that can be set up quickly and easily and can be aimed at things in the sky quickly, simple as that. More advanced telescopes are essentially computers you look through, and they are far, far beyond the needs of an absolute beginner. All they need is a telescope that will let them see amazing things “up there” that they can’t see with their naked eye, such as the mountains and craters of the Moon, the rings of Saturn, Venus as a crescent, and some of the beautiful “deep sky” objects such as galaxies, star clusters and nebulae. And thankfully there are now plenty of beginners telescopes available that will let them do just that. Having said that you must be careful to go too far the other way and buy a telescope that’s too simple, i.e too cheap, because it will be of such poor optical quality that it would be next to useless. Get someone (or treat yourself to!) the wrong telescope – a telescope that’s too cheap or too advanced – and you’d be wasting your money, to be brutally honest, because this is what would happen. Christmas Day would come, your loved one/friend/whoever would unwrap the telescope and – if the sky was clear that night – they’d manage, possibly after a lot of struggling, to get the telescope aimed at the Moon, and maybe a bright planet. That in itself could be disappointing because cheap telescopes usually have such poor optics that the image would be blurry and distorted, and also because cheap telescopes come with such unstable tripods that they shudder and shake too much to provide a steady view. Now, this might surprise some readers, but I would urge people VERY strongly NOT to buy a “GoTo” computerised telescope, not for a first telescope anyway. Why? Don’t they make finding things in the sky easier? Don’t you just tap a few letters or numbers into a keypad ad it does everything for you? Well, yes, but only once they have been aligned with some stars in the sky, so you have to know the names and positions of the brightest naked eye stars in the sky before you can even get such a telescope up and running. Once the telescope is aligned off you can go, roaming around the wonders of the night sky to your heart’s content, but to align it you will have to be able to point it, manually, towards two or maybe three bright stars in the sky selected from its computer database, and if you don’t know the names and locations of those stars – in other words if you don’t know your way around the sky with your naked eye – you’re (technical term) stuffed. So what you want is a good quality “alt-azimuth” telescope, that’s one that has no motor drives, no setting circles, no fancy computer; you basically just swing the telescope tube around, and tilt it up and down, until it’s pointing at what you want to look at, and you do that by centering your target in the middle of the small “finder scope” on the top of the main telescope. I’ll say again: there are LOTS of good beginners telescopes like this available now, far too many for me to try and list even a few, so instead I’m going to point you towards two dealers I know and trust personally, having had dealings with them before. Both of those companies have great beginners telescopes for sale, and will be delighted to answer your questions. Of course, for some people getting a telescope will be premature. Telescopes make tiny, faint objects in the sky appear bigger and brighter. That’s their job. However, if you don’t know where those things are in the sky in the first place, a telescope will be pretty useless. All you’ll be able to do with your new telescope is point it randomly at the sky, or swing it to and fro, hoping something interesting appears in the eyepiece. So what should you do? * They’re cheap – £30/£40 for a good pair. * They are easy to use – just point them at something and look! Telescopes need setting up, aligning, collimating, etc etc. * They are light and easy to hold – telescopes are heavy, cumbersome. * They are great fun for kids to use. * Countless star clusters+, galaxies+ and nebulae+. As for which pair of binoculars you should buy, it’s all about the numbers. The best binoculars for stargazing are models like “10×50” or “7 x 35”. The first number is the magnifying power of the binoculars, the second is the aperture of their lenses in millimetres. Browsing online or in an actual shop you’ll be faced with a bewildering variety of models. Don’t panic. When you look at what’s on offer, just look at those two numbers and do a quick sum with them: as long as the second number can be divided by the first number five times or more, that pair will be fine for stargazing. Just be careful you don’t buy a pair of binoculars that are too heavy to hold steady. You can always buy a tripod to support them, of course, but then you’re looking at adaptors and more expense. Just stick with a pair of 10x50s and you really can’t go wrong. Lastly, you might see some gorgeous-looking binoculars on offer on market stalls or in discount shops, with very fancy-looking orange, green or yellow lenses. Don’t buy them. You want your binoculars to have good, old fashioned blue-purple lenses, which mean they have coatings to give superior views. Orange, green and yellow lenses are pretty rubbish for stargazing. * If you want to buy a telescope as a Christmas gift there are now lots of great beginners telescopes available. Just be careful not to get something too complicated. * If you’re not sure in any way about buying a telescope, consider getting a pair of binoculars instead. * Buy a good “beginners guide to astronomy” book, or borrow one from the library. I can recommend one. If you follow that advice, trust me, you’ll avoid a lot of trouble, disappointment and heartache. This is the advice I’ve given to many people before, and the ones who took it have thanked me. The ones who ignored it told me later they wished they’d listened. I really hope this advice helps. I’m not trying to burst any bubbles, but the quickest way to destroy someone’s blossoming interest in science and astronomy would be to buy them something they find they can’t use. What about other gifts for the “spacey” person in your life? Well, how about buying them a meteorite, a REAL piece of space? A quick Google search will point you towards a meteorite retailer in your part of the world. Or how about a magazine subscription? Ok, that’s it. Wishing you all a Merry Christmas and Happy New Year, and lots of clear skies in the year ahead! When I heard that Libby Jackson – known to many people I think it’s fair to say as “the public face of Tim Peake’s mission to the space station”, but known to many of us in ‘the space community’ as a tireless media commentator, out-reacher and communicator – was writing a book about women who have been into or helped other people get into space, a mental countdown began, the same kind of countdown that ticks and tocks away in my head like a metronome while I wait for a new Star Wars film to be released or a new series of Doctor Who to begin. Frustratingly after getting it home I only had ten minutes to flick through it before I had to go out again, to work, but this afternoon I’ve had a chance to go through it properly. Was it worth the wait? Is it the book I’ve wanted to read for so long? Is it the book that deserved – no, needed – to be written to pay proper tribute to some amazing people? “A Galaxy Of Her Own” is a sumptuous book. Now, I know that’s a quaint, old-fashioned word in 2017 but it’s honestly the only one I can think of that will do. I fact, I could easily tap out a dozen cliches here that describe it – “richly illustrated”, “a loving tribute” etc – and they would all be true. But basically this is a beautifully produced book written by a great writer, by someone with a wonderful knowledge of and love of her subject. It is so crammed full of incredible stories that I was worried they would tip out and spill onto the floor if I didn’t shut the book properly. So who is in the book? Well, where other books might have focussed just on women who have flown into space, on the astronauts and cosmonauts who have actually gone up there, “Galaxy” casts its net a lot wider, and profiles not just space farers but the people who made – and still make – it possible for others to go into space. There are profiles of engineers, scientists, computer programmers, nurses, and many others too. This was a really pleasant surprise, and makes the book much more than a volume of astronaut biographies. There’s a real sense of history to the book too – it opens with the story of Emilie de Chatalet, a brilliant French physicist from the early 1700s who translated Newton’s writings into French, and it goes on to tell the stories of woman alive today, still working in the field of space exploration. So, dipping into the book you can read all about the lives and careers of woman from all backgrounds and periods of history. There are the stories of the ‘famous’ people you would expect to be in there, the usual suspects like Valentina Tereschkova, Sally Ride and Ada Lovelace. There are people you might, like me, be less familiar with, such as Jerrie Cobb (who should have been a Mercury astronaut) and Dee O’Hara (a nurse who worked with astronauts right through from the first days of Mercury to the Skylab missions). Some of the book’s profiles are of people who I had hoped would be in there but didn’t really expect to be, such as British scientist Monica Grady (SO good to see her story in a book!). Here and there a “wild card” appeared in the book as I flicked through it, someone who I hadn’t imagined for a second would be in it, but definitely deserves to be. Nichelle Nichols – Lt Uhura from the original Star Trek series and films – is in there (illustrated quite beautifully by LCC artist Ehigie Aigiomawu), as are “The ILC Seamstresses” who sewed together the spacesuits that kept the Apollo astronauts alive in their spacecraft and in the Moon. It was an absolute pleasure, and quite humbling, to read their stories. Design-wise, this book was, I’ll be honest, not what I was expecting – but I hasten to add that’s a good thing. I fully expected it to be a traditional “profiles” book, with a block or blocks of text accompanying one large, or several small, photographs of the individual concerned. After all, there are lots of books with that format, right? Not this one. This one has text, yes, but opposite that text is a piece of art, not a photograph. Each woman profiled in the book has been painted, sketched or drawn by one of the students from the London College of Communication. Clever, and this sets it aside from many other “profile” books on the shelves. However, I have to be honest and say – and I have to stress that this is just a personal thing, I’m not passing any judgement on quality or ‘worth’ – that some of the art styles appealed to me more than others. Some (the more realistic) really appealed to me, while other portraits, painted in more abstract styles, didn’t appeal to be as much, or at all. Some I thought looked distinctly…odd, disturbing, even, and I came away from those spreads with no actual idea of what that person looked or had looked like. But as I say, that’s more about me and my relationship with art than the book, and I can (and will) Google those people to see what they actually looked like, so it’s not a big deal. Other readers will, I’m sure, adore each and every one of the portraits. But there’s such a wide variety of styles in the book that flicking through it I felt a bit distracted now and again, like I was looking through an art gallery catalogue and not reading a science book. It’s a weary cliche now when a book, or a CD, or a DVD is hailed as “The perfect gift for Christmas”. But honestly, if you have a young ‘un – especially but not exclusively a girl – who is “into space”, who has a dream of going to the Moon or Mars one day, then this book really IS the perfect gift for them this Christmas. It’s in the shops now. Unless you’ve been living in a cave on Vulcan you’ll know that there’s a new “Star Trek” series on TV. “Star Trek: Discovery” takes place after the years of the series “Enterprise” and before the Kirk years of the Original series. I think it’s fair to say it has, er, “divided” Star Trek fans. Some love it. Some hate it. Actually, a quick look on Twitter will show you that some loathe and detest it to a quite stunning degree. That’s not too surprising really. After all, the…reluctance… of science fiction fans to accept change is well known, you might even say legendary. For example, whenever a new Doctor is cast in Doctor Who now, war breaks out online as die hard fans predict the new actor will ruin the show. When a female actor was recently revealed as the new Doctor it was unbeLIEVABLE the amount of rage and fury that erupted. And Star Trek is as bad; the fans of the show are very, very loyal, some to the point of obsession, and when they feel “their” beloved show is threatened they rebel. And boy, have they rebelled over “Discovery”. They hate the new characters, they hate the design of the ship, they hate the uniforms, they hate the music and the opening titles… they hate almost everything about it. “It’s… not… Trek!!! !” they howl, falling to their knees like Charlton Heston at the end of Planet Of The Apes. But others have fallen in love with the new show, declaring it is a “shot in the arm”, or claiming it has “breathed new life” into the franchise. Neither. Both. It doesn’t matter. This is something you have to decide for yourself, if you’re a Star Trek fan. I think your enjoyment of “Discovery” will depend on how willing you are to embrace change, and… dare I say it… move on. I know those two words usually make sci-fi fans break out in a cold sweat, but seriously, it’s time. If you are one of those fans who think that the only good Trek is TOS (“The Original Series”) Trek, with its wobbly sets, unconvincing monsters and velour uniforms, then boy are you going to hate the new series. If you are one of those fans who hated the JJ Abrams “reboot” films because they were too glossy, too shiny, too… modern… then “Discovery” isn’t for you, because it looks and feels more like those films than the original series. If you loved the most recent films I think you’ll love Discovery, I really do. So, what did I think of “Discovery”? Well, I’ve watched the first three episodes now (I actually subscribed to Netflix so I could watch it… not JUST so I could watch it, I’ve been thinking of jumping down that rabbt hole for a while, this just helped me make up my mind), and I love it. I do. It’s not just “good Trek”, it’s good drama, full stop. The first two episodes were suitably action-packed and looked absolutely sumptuous. They were very dark in tone, quite militaristic, which made them more like the rebooted Battlestar Galactica than the original or even Next Generation “trek” series. Those forst two episodes introduced the new main character, Michael Burnham well, and rebooted the Klingons very effectively, making them seem interesting, dangerous and “alien” again, after they had become rather too human, too cuddly and too comical in the pre-reboot TV series. I finished watching ep2 and thought “Yeah, that’s good… I like that…” Not Earth-shatteringly original, not slap-across-the-face radical, but definitely “Trek” and very watchable. And then tonight I watched episode 3. And the show took a big leap forward. Suddenly it all made a lot more sense, the darkness and conflict I mean. In Voyager the Maquis were supposed to be edgy mutineers and rebels, but they just came across as unconvincingly sulky. Michael Burnham is a genuinely tortured character, painfully aware that she has thrown away everything she has worked so hard for, even though she still believes she did it for the best reasons. At the start of episode 3 her life seems to have been flushed down the toilet but then along comes the Discovery, and its Captain, Lorca, and everything changes. By the end of the episode we are in a new Trek, a different Trek, but one that links firmly and affectionately to previous Treks, no matter what those die-hard fans may tell you. Ok, let’s be honest here: like those Doctor Who fans who needed CPR when they heard a woman actor was taking over the role, and the Star Wars fans who hated the fact that both Force Awakens and Rogue One had female leads, there will be some ST/sci fi fans who just don’t want a female lead. Not many, but some. Well, tough. Discovery has one, and she’s a good character too. I am looking forward to seeing her developing. As for the others, watching Jason Isaacs playing Captain Lorca made me wish he’d been in a Starfleet uniform YEARS ago, he’s a natural for The Big Chair. The “interesting alien” character is promising, too. The others… hmmm, we’ll see. I’ll admit, the first time I watched the opening titles and listened to the music on YouTube I thought “Hmm…. not sure about that…” and tree episodes in that hasn’t changed. I quite like the animation style, and I do like the music, but I’m just not sure about the actual content of the titles. Some sequences seem to bear absolutely no relevance to the show whatsoever. And I don’t like the parchment-yellow colour scheme either. That’s odd, and distracting. Ah, the new ship… the USS Discovery, NCC1031… how Trek fans despised this ship when it was unveiled! With its blocky, angular body, split-ring saucer section and odd-looking nacelles it looked nothing like any Starfleet vessel seen before. And I’ll admit that the first time I saw it I thought “Ugh, no, don’t like that…” But having seen the 1031 in action, in flight, I’ve come around, big time. The whole point is she’s not SUPPOSED to be a “standard” Starfleet ship, she his operating kind of outside of Starfleet, a rogue ship, a ship with a mysterious purpose, so of COURSE she’s going to look different. I’m sure all will be explained in episodes to come, but I’m happy to wait and find out. She’ll get there. Klingons and Vulcans? Check, and check. It’s just the way of things. So, I enjoyed “Star Trek: Discovery” and I’m impatient for the next episode. You might see it ad hate it. That’s fine. Just watch it and make up your own mind afterwards, don’t just assume it’s “rubbish” or “wrong” – or “brilliant” or “right” – just because others have said so. It might not be for you, but at least decide that after watching it. For the past 13 years Cassini has become part of our lives – and by “our” I have no hesitation in lumping together professional scientists and astronomy- and spaceflight-enthusiasts. We have gotten used to (but hopefully never taken for granted) living in a world where we could go online and, with just a couple of clicks of a mouse or taps of a touchscreen, see brand new images sent back by Cassini. Not just now and again, but literally every single day. It’s as if we’ve been riding piggyback on the probe, swooping around the Saturn system like Harry Potter on his broomstick, seeing what Cassini was seeing. Through Cassini’s unblinking eyes we’ve watched golden sunlight glinting off Titan’s methane lakes, seen aurora fluttering and flickering around Saturn’s poles, and glimpsed Earth shining through a gap in Saturn’s rings. We have truly lived through a golden age of exploration. And on Friday it all ends, with Cassini hurtling into Saturn’s curdled clouds, streaking through it, briefly trailing flames like the Enterprise burning up in the atmosphere of the Genesis Planet before flaring and fading away, gone forever. It will be a sad, sad day. Literally the end of an era. Some people are asking “what’s all the fuss about?” They say “It’s only a machine!”. And that’s true. Cassini is just a machine, a collection of (perfectly) manufactured and assembled parts put together to do a job, and that job was to study Saturn and its moons. That job is now over and it will be disposed off in the most effective way. Why all this wailing and gnashing of teeth over a machine? Because Cassini is more than just a machine. True, as it plunges through Saturn’s clouds it will not be aware; it won’t feel excitement or fear. It won’t feel pain as the heat of its entry into Saturn’s atmosphere turns it into a flaming torch; it won’t scream as pieces of it snap off and spiral away behind it; it won’t howl as what’s left of its body finally falls apart into a cloud of debris that will then be scorched to ash, ash that will be caught by Saturn’s winds and scattered like charred confetti. It won’t feel a thing. But back on Earth many, many people will. Because like all these amazing machines Cassini was made by people, not other machines. Back in the 1980s Cassini was designed by people using computers which now are on display in museums. It was then built by incredibly skilled engineers and technicians, put together piece by piece like the most complicated jigsaw puzzle or model imaginable. Then it was launched and guided safely to Saturn by yet more incredibly skilled people. And since arriving at Saturn 13 years ago it has been steered around the planet – sent skipping from shining icy moon to shining icy moon, sent soaring above, beneath and over its rings, flown around and around Titan -by yet more amazingly clever and skillful people. Every one of them worked unbelievably hard, over many, many years, to get to do those jobs and to have those responsibilities, and once they were on the mission and contributing to it they dedicated themselves to it. How many family birthdays did they miss because they were working on Cassini? How many anniversary presents did they forget to buy because their heads were full of Cassini “stuff”? How many of their children’s school plays or music recitals did they have to miss because they had to work late to solve an “issue”? Cassini left Earth in 1997, twenty years ago. Twenty years. During that time, I wonder how many of the people working on it have had children? How many of them have got married? How many of them have seen their babies grow up and go to college, or get married and have children of their own? When Cassini has gone it will leave a big hole behind for those of us who are “into” this kind of thing. I know I will miss going online each day and drooling over the latest images showing exquisite detail in Saturn’s rings or tiny details on the surface of one of its moons. But imagine how the men and women on the Cassini team will feel. Many of them will have spent a lot – some, perhaps all – of their professional careers working on it; when the mission is over they are going to be absolutely gutted. It will leave a gaping hole behind. So, you see, Cassini isn’t “Just a machine”. It’s the tip of a huge, huge iceberg of human experiences. It has been a very important part of many people’s lives. As a voyage of exploration and discovery, Cassini’s mission will be viewed in years – in centuries – to come as being every bit as important and historic as those of the great explorers of the past, who crossed storm-tossed oceans, scaled towering mountains and hacked through jungles in pursuit of knowledge. Cassini’s ocean was space; its towering mountain was the Sun’s gravity; its jungle was Time. We are all lucky, and privileged, to have been alive at the time in mankind’s history when Cassini was studying Saturn. So when you see those scientists looking ready to burst into tears – or actually bursting into tears – on Friday, don’t think “Oh come on, it’s just a machine!” Cassini is a machine of metal, glass and wire, yes, but it’s a machine built with love, held together by insatiable curiosity and flown on invisible wings of dreams. To every one of those people sitting behind a desk on Friday, staring at a monitor, Cassini will mean something different, but important. Professional to the end they will look calm, cool, collected, but as Cassini falls silent they will feel its loss very personally, and sincerely. I wish I could be there to stand behind them and just squeeze their shoulder. A great adventure is about to end, and it will be a long time until another mission shows us such amazing sights or tells us so much about one of our sister worlds as Cassini has done. So on Friday, watch the NASA TV coverage if you can, and bid Cassini a fond farewell. She has been a proud ship, and has served us well. By Friday night her voyage will be at an end, but she will live on through her images and her scientific results. And every time we look at Saturn from now on, either with just our naked eyes or through the eyepiece of a telescope, we’ll know that Cassini is still out there, flying through the planet’s butterscotch-hued clouds, riding the planet’s winds. Lots of Facebook pages and websites are screaming out that there is going to be a huge display of the northern lights on Sunday night. Is there? Well now, not wanting to build anyone’s hopes up unrealistically, and absolutely, definitely NOT saying something WILL happen (please read that last bit back again, it’s important!) but yes, there’s a reasonable chance that people in parts of the UK *might* be able to see the northern lights on Sunday night. There has been a big eruption on the Sun which has hurled a huge amount of solar material right at us, and if everything goes well – and there are no guarantees that it will! – then the aurora borealis *might* be given a big enough kick on Sunday night and into Monday morning to bring it far enough south to make auroral activity visible from the UK. It’s important to be honest and realistic about this though. Apart from the basic fact that we’re not sure anything will happen, it’s the middle of summer, so the sky will not get truly dark, meaning any aurora that is triggered will be somewhat subdued compared to how it would look in a really dark sky. So, with that in mind what should you be doing? Well, first of all be prepared to see absolutely nothing and don’t get your hopes up too much. Like comets and NLC, the aurora likes nothing better than to promise us a good display then do nothing. The best thing you can do is be somewhere which will offer you a good view *if* something happens. And that place will be somewhere away from streetlights, with a clear view to the north, with no mountains, hills or tall buildings in the way. If you can jump into a car and get out into the countryside and find such a place, perfect. If you can’t, just do your best. If you’re stuck at home still take a look from your garden. You might be lucky! Be in place after dark on Sunday night – then all you can do is wait and see what happens. But again, it’s important to have realistic expectations. When shown on TV and in films the northern lights are usually a) speeded up and b) enhanced to make them appear brighter and more colourful than they actually appear to the naked eye. Magazines, books and websites love using photos showing a sky full of vivid green curtains, tall cherry-red search-beams and golden arcs whenever they need to illustrate a story about the aurora, and a major auroral storm can look like that – but most don’t. During most displays you might, if you’re lucky, see reds and greens but much more subdued than those photos – which are also usually long exposures taken with very sophisticated cameras and then processed to enhance them – show. So on Sunday night if you can get to a good observing location be on the look out for pale green, almost grey beams, curtains and arcs in the northern sky, with maybe a hint of pink here and there. If a big display kicks off the colours might get brighter and more obvious, just cross your fingers. As for movement, yes, there could be movement, and in a a major display you can see why the aurora is also known as “The Merrie Dancers” in Scotland, because they can leap and sway and swish about. But more likely you’ll just see features slowly fading in and out of view, brightening and fading away again, and might see activity rippling from side to side as you watch. Of course, if a major display does kick off then the sky could go nuts, then all you can do is stare up at it in wonder and enjoy it. But, again, without wanting to sound like a stuck cd, please be aware that this is not guaranteed for Sunday night, if anything happens at all. So, bottom line… this is just a heads up that people in parts of the UK *might* be able to see the northern lights on Sunday night, but there are no guarantees. But if you don’t look it’s guaranteed you’ll see nothing! You should be thinking about being somewhere with a clear unobstructed view to the north after dark on Sunday night, but prepared to see absolutely nothing. Prospects might improve or worsen as today and tomorrow pass, so keep monitoring Facebook’s aurora-watching groups (we’ll try to post updates on here tomorrow evening but can’t guarantee it!) and, if you’re a Twitter user, there are lots of aurora-hunters on Twitter you can follow for updates too. And if you have an aurora alert app on your phone, make sure it’s turned on tomorrow night. Lastly, be aware that you are totally at the mercy of the weather, and where you live will dictate what you see: if you live in the north of Scotland the aurora will have to be very bright for it to cut through your bright night sky, but people further south might, ironically, have better luck. That’s it really. All we can do is cross our fingers and hope for the best! If you do see something be sure to let us know and send in any photos you manage to take. Fingers crossed for some UK auroral activity tonight. Great weather forecast for Cumbria (some mistake surely???? ), and the stats are looking good, so now it’s just a case of impatiently waiting for darkness to come and getting out there to see if anything is going on. Absolutely no guarantee we’ll see anything, of course, but it’s worth a look. Many people will go out tonight expecting – if not demanding, after all the hype – what I call a “Joanna Lumley Class” display, with a sky ablaze with green curtains, flapping and swooshing like a ship’s sails in a storm, with cherry red beams shooting up into the sky like WW2 searchlights. They’re (probably) in for a big disappointment. It’s mid-July, it never gets truly dark this time of year, so if we get some pale grey-green beams and a green “rainbow” arc I’ll be happy. Anything better than that will be a bonus, we’ll get what we’re given. If you are planning on heading out, make sure in advance your camera batteries are charged, you have lots of room on your memory card, and your lenses are all clean; you don’t want to run out of power, or storage space, or find your photos spotted with dust circles when you look at them tomorrow. And be prepared for a long night – don’t expect the sky to “kick off” according to *your* timetable re sleep and work etc, any activity might be delayed into the early hours or until it’s daylight here in the UK again. But don’t over-think it. Just get out there, if you can, and see if anything is going on. ** And again, there’s no guarantee we’ll see anything, all I’m saying is it’s worth a look, ok? ** Good luck, all! Well, the first wave of solar material hit us earlier today (earlier than expected) and it triggered very dramatic aurora above Canada. All we can do now is cross our fingers and hope that there’s something to see later this evening, when it gets what we laughingly call “dark” at this time of the year. Remember, no-one is predicting we definitely will see the northern lights. All we’re doing is giving people a heads-up that it’s worth looking for them, just in case everything works out. 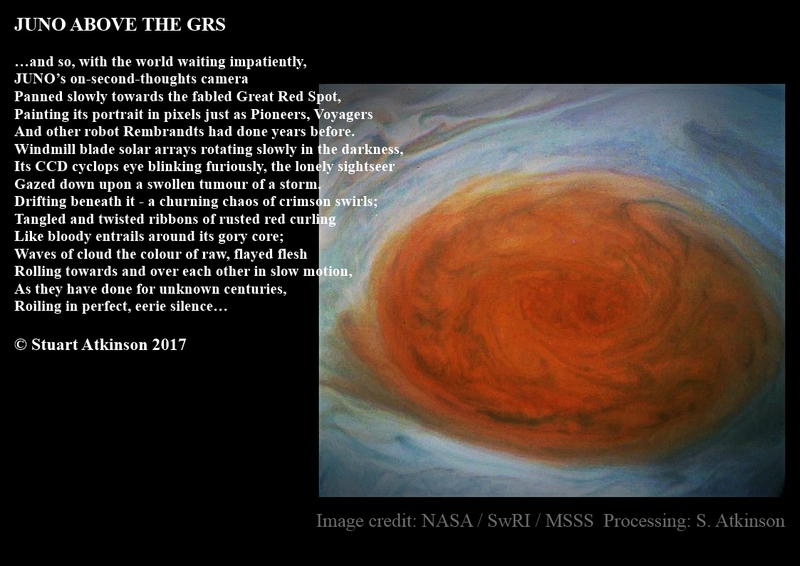 If you felt a disturbance in the Force on Wednesday night it’s because the first images JUNO took of Jupiter’s Great Red Spot were released at teatime on that day, a couple of days earlier than expected, and both the astronomy media and the world’s “image processors” went into a feeding frenzy. (I couldn’t because I was stuck at work, but I was able to sneak a look at the images on my phone during my break). The original images are very pretty but quite muted and low contrast, so since they have been released the processors have been working hard to bring out detail, boost contrast and enhance the features around and within the Spot, using a variety of image processing techniques. Some of the results are eye-wateringly dramatic, psychedelic explosions of vivid colour. Others less so. None are “right”, none are “wrong”, they’re all just someone’s personal take on what the images inspired in them. But the main thing is that NASA, and the JUNO team, actively encouraged members of the public to take their images and basically mess about with them, and have fun with them! I love it when people take the time to work on images like this, it means they’re engaging with a mission, investing a little bit of themselves in it, and “spreading the word” about it too. This is what I do with my Mars rover images, and it’s brilliant to see so many people having fun with the JUNO images. It proves, I think, that space exploration can be inspiring to everyone, not just tech types and science experts. And the joy that has greeted the release of these images is even more welcome because JUNO was almost sent to Jupiter *without* a camera, because its main reason for going there was to take measurements and do observations which showed their results as squiggly lines on graphs and charts – fascinating and exciting to the people involved in that, and as worthy as any image, but not very inspiring for the public. Like it or not, “pretty pictures” from space are what people see and enjoy, and the equation is quite simple: pretty pictures + public support = political funding. So, a little late to the party, I know, and with most of the buffet already eaten, here are my processed versions of the images. Others’ are much, much better; I don’t care. I had fun making these. They’re not meant to be scientifically accurate or “useful”. They’re just shamelessly pretty pictures. And sometimes that’s enough. Some people get very sniffy about this kind of thing. They moan and twine that the colours “aren’t real” or “accurate”, as if to say that amateurs shouldn’t bother – or be allowed – to take the images probes sent back and work with them. I wish they wouldn’t be like that. Most aren’t, it has to be said; the VAST majority of people involved on these missions are very encouraging and supportive of the efforts of amateur image processors like myself. But a few are not so keen, and seem to enjoy being critical and a little bit mean. And that’s a shame.